“Barnabas, why do these things keep happening?” Vicki says. Barnabas sighs, and says, “One mistake can multiply into a thousand,” which is not that much of an answer. But things certainly do keep happening, if by “things” you mean time travel and blood transfusions and dream sequences and harpoon attacks. And why would you ever mean anything else? 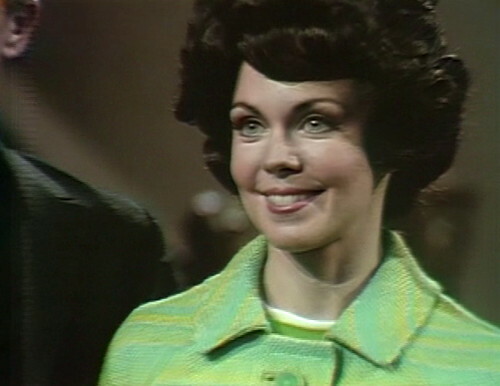 Unfortunately, the thing that isn’t happening is that Julia’s not on the show today, so she’s not available to play Junior Detectives with Barnabas, the way that they did yesterday. Today, he has to pair up with Vicki, and it’s like they sucked all the fun out of the room. Yesterday’s post was pretty much a non-stop squee-fest about Barnabas and Julia’s relationship, which suddenly blossomed into a remarkably intimate friendship, all at once. They were drawn together by a mutual concern about Roger, and before you know it, Barnabas was telling Julia all of his secrets. 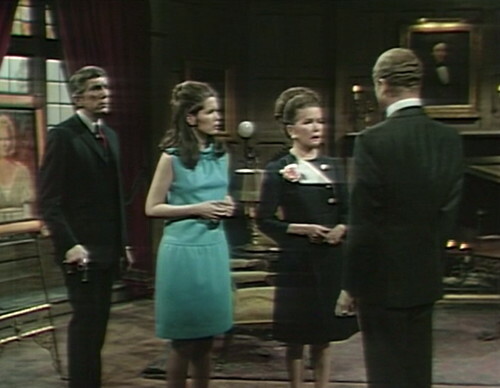 Barnabas and Julia brainstormed a bit on Roger’s problems, and then they went out together and rescued Dr. Lang from an assassination attempt. They also touched each other on the arm a lot. It was an emotionally satisfying day. And, man — I know that Barnabas says that he’s romantically interested in Vicki and not in Julia, but check out the body language on display right now. He spends most of the scene holding his cane awkwardly in front of him, drawing his shoulders together and crossing his hands over his crotch. You can’t get much clearer than that. No sale. He’s also a lot more restrained with the telling-secrets behavior. He keeps telling Vicki part of the truth about Roger, but then backs off at the last moment. Barnabas: Julia and I saw him last night, at Dr. Lang’s. Barnabas: I don’t know. Perhaps he is, but in a way that Dr. Lang cannot treat. He was most peculiar… and that’s all I want to say. He looks down for a moment, and then he just goes on with another part of the story, as if “that’s all I want to say” is a perfectly normal way to end a sentence. Vicki tries to press for a direct answer. 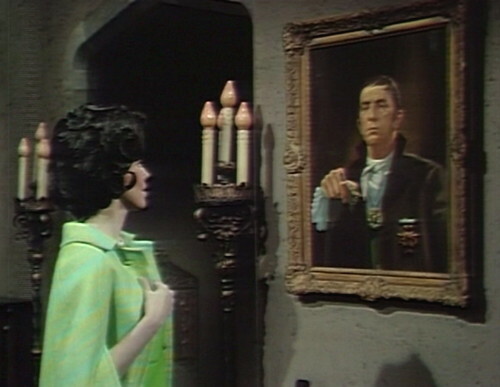 Vicki: Barnabas, you know something I don’t. Barnabas: Well, perhaps I have a greater intuition about what is wrong… than you. He kind of drifts off at the end there, like even he has to admit that’s not a very good explanation. The body language is getting even more awkward and extreme. Is there anyone in the audience who still takes a Barnabas/Vicki romance seriously? Fortunately, at this point some new excitement walks in the door. Roger’s come back, and he has big news for everyone. Roger: Vicki! Ask Mrs. Johnson to bring in some champagne, will you? Roger: Yes, my dear sister! We have much to celebrate! Roger: In a moment, you will see. And then: look what the cat drags in. Roger: Here we are. Now, if I may, I would like you all — to meet my wife. Yes! It’s Angelique’s classic supervillain trick of coming back from the dead just when you least expect it. In fact, this is such a great trick that they’ve done it four times in the last three months. But this ta-DAH! is the best by far, possibly the best one that they ever do. Since Angelique died — at Barnabas’ hand, obviously — she’s made regular return visits as an avenging spirit. Those were fun — it’s always a good time when the insane supervillain is around — but they felt a bit like cheating, especially her entirely unmotivated appearance at Vicki’s witch trial. This time, it’s a complete knockout. Over the last couple weeks, we’ve had every reason to think that Angelique is actually dead, and will only appear in the 20th century as a haunted portrait. 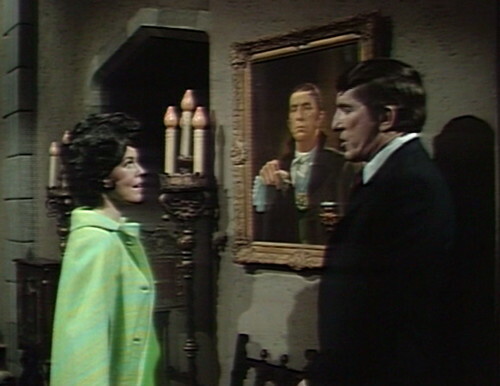 She’s been able to bend Roger to her will, and Barnabas’ attempts to destroy the portrait have failed. They could have just used the sound effect cart of her laughter, with the occasional disembodied head floating around. But here she is — alive and unbothered, wearing a black wig and calling herself Cassandra — and she’s maneuvered herself right into the heart of present-day Collinwood. This is a stunning sneak attack; even Barnabas doesn’t live at Collinwood. And yes, it’s Angelique, obviously. I’m not going to even bother with the idea that this is a “spoiler”, because anybody with common sense and televisual literacy can tell that this wide-eyed crazyface couldn’t belong to anyone but the freak from Martinique. They keep the mystery alive all the way up until the end of today’s episode, and we’ll get an explicit confirmation tomorrow. Remarkably, this throws away some valuable story time. They could easily have spent a month pretending that the audience doesn’t know the big secret — they actually do that story with Angelique and a twin sister in early 1970, and it works. But right now, there’s so much fun to be had with the genuine article, standing here in the drawing room and driving Barnabas absolutely out of his mind. Because it’s all about secrets, really. Characters who share secrets are always more interesting, especially if the secrets are shared with the audience. If we were supposed to think that this scene is actually what it appears to be — Roger coming home with an ordinary gold-digging soap vixen — then there would be no reason to do big act-break close-ups and dramatic stings. It’s the secret history between Barnabas and Angelique that makes this an emotionally charged situation. So we lose the question of “Is Cassandra really Angelique”, but then we move on to more interesting questions, like “What is she planning to do?” and “Can Barnabas expose her without giving himself away?” and “Is Roger evil now?” Everything is different. The strongest characters on the show — Barnabas, Julia, Angelique, and eventually Quentin — are all people who can completely change the story just by walking into a room unexpectedly. Those characters have a private agenda in every scene; it’s impossible to imagine a Julia scene that we’re supposed to take at face value. If Liz and Julia have a quiet conversation about David, we always assume that Julia’s got an angle. It can’t just be a straight recap scene, as it would be for Carolyn, or Joe. But Barnabas is still keeping his secrets from Vicki, so the Barnabas/Vicki scene just collapsed in the middle of the conversation. He drifted off into “that’s all I want to say,” and Vicki let it drop. This is the thing that people miss when they talk about soap opera couples. Two characters don’t have to be in love with each other to be a “couple” — although they often are, which is why people think that’s the definition. Two characters are a “couple” when a scene with them together is way more interesting than a scene with them apart. It makes absolutely no difference whether they love each other, or hate each other, or they’re partners, or best friends. Kirk and Spock are a couple. Ernie and Bert are a couple. Barnabas and Julia never have an explicitly romantic storyline, but they’re a very important couple — one of the two most enduring supercouples on the whole show. Barnabas and Angelique is the other one. And now all three of them are in the house at the same time. Isn’t life thrilling? Tomorrow: You Only Live Twice. A logic puzzle: Angelique has clearly fed Roger the idea of a honeymoon in Martinique; he couldn’t have come up with that on his own. But then she spends an episode and a half trying to convince him to postpone the trip. Why’d she put it in his head in the first place? Barnabas: Vicki, do you trust me? Vicki: You know I do. Barnabas: I try to remember that. Just as I try to remember… that I must not reproach you for the reasons you’ve given not to marry me. 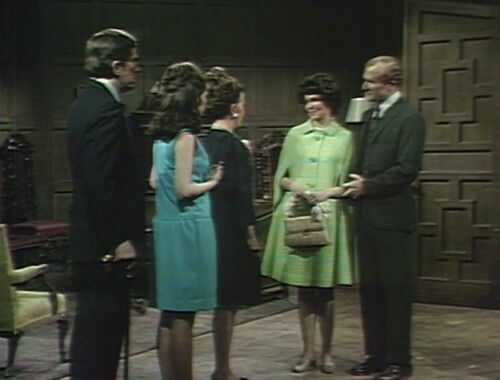 Towards the end of act 2, the drawing room scene ends with Cassandra smiling innocently at Barnabas, before cutting to Roger and Liz in the study. But the shot lingers on Cassandra longer than she expects, and you can see her quickly glance over to the camera to see if it’s still focused on her. Roger: I don’t think I owe you an explanation. Would you owe me one, if you decided to remarry? Liz: I most certainly would. 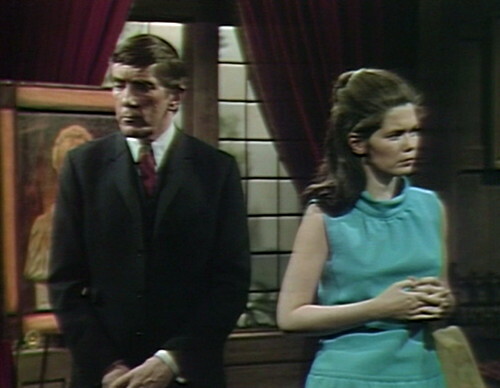 Dark Shadows reruns began airing on local stations in 1975, with the first six months of the Barnabas storyline (episodes 210 to 340) released in syndication. In 1976, another 130 episodes were released — episodes 341 to 472, bringing the show through the 1795 flashback. At that point, the reruns stopped. The company that distributed the series, Worldvision Enterprises, had to pay substantial residual payments to the actors, writers and directors when each new six-month cycle was made available, and it was only cost-effective to release another cycle when a significant number of local stations wanted to air them. 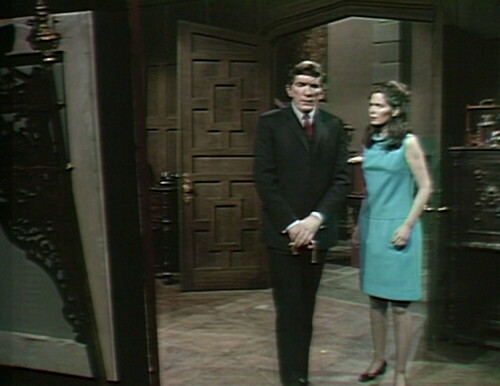 There weren’t enough stations interested in Dark Shadows in 1976 to release more episodes, so the stations that ran the show got to episode 472, and then abruptly stopped. In the early 80s, Worldvision started to promote the show again, with a number of NBC affiliates airing the show in 1981 and 1982, including WNBC-TV, the flagship station in New York. To make the show more attractive to stations, Worldvision started releasing more new episodes in 1983. The second year of syndication started with this episode, and continued to episode 735, through the first few weeks of the 1897 storyline. The stealth reboot continues with Barnabas expressing genuine concern and affection for Roger, whose son he was planning to either kill or convince everyone to have sent away. He has already assumed the “family protector” role (even if most of the danger is a result of his own decisions, it’s still a good start). 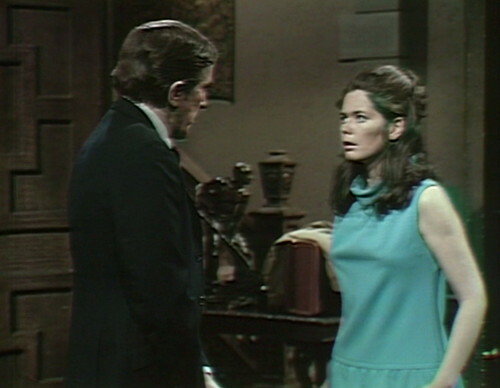 The Barnabas/Vicki relationship is a non-starter because the supposed “obstacle” is Barnabas’s secret — he’s a (former) vampire. Julia shares that secret, which not only means that the scenes between them are more open but it makes us like Julia more because she knows and accepts him. If Barnabas is afraid that Vicki will reject him if she knows what Julia already does, then why should we support the relationship or even like Vicki? This is where the geeky kid in us comes in — we all have secrets (some as big as our developing sexuality or as small as our still reading comic books). We identify with the characters on TV who have these secrets and we definitely adore the characters who find out and share in them because it’s what we desire most. We don’t wan to be “cured” of our metaphorical vampirism in order to be accepted. Sometimes TV series themselves don’t “get” this. Fans rooted for Clark and Chloe on SMALLVILLE and mostly loathed Lana because Chloe was the friend and confidante we wanted. Lana was the judgmental (insert bad name here) who wanted to know our secret but mostly because there was power in knowledge. She’s the girl in college who is offended because her male best friend didn’t come out to her as opposed to recognizing how difficult this was for him (because everything is not about her). And, of course, on ANGEL, they originally tried to pair up Angel with the police detective Kate, but she resented vampires and practically had an antagonistic relationship with Angel that was hardly Tracy and Hepburn. We weren’t going to root for a “couple” where Angel has to prove to Kate that he’s special and awesome. We’re already on board with that, so we root for Angel and Cordelia. In 1897, the writers make the great choice of having Beth fully aware of Quentin’s full moon problem and actively trying to help him. We share Quentin’s concern that he might kill her as a werewolf and that makes us like her more for sticking around. That’s far better than the only conflict being his fear that she’ll learn he’s a vampire. Vicki could have returned from 1795 with knowledge of Barnabas’s secret. There would still be potential conflict, but there was a desire to keep Vicki “innocent,” which only resulted in keeping her dull. Roger is a real mover and shaker..first a phoenix then a witch. 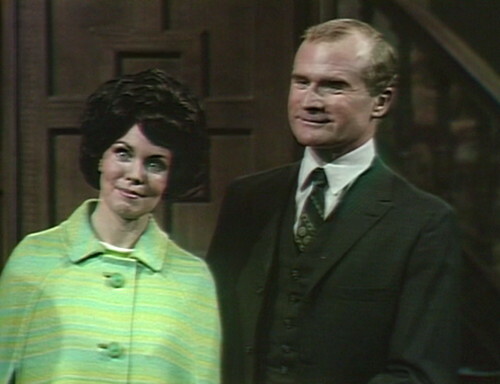 Here’s the reason Louis Edmonds is my favorite actor on this show – look at the screenshots of him compared to the other three ‘mopes’ in the room (Vicki, Liz, and Barnabas) – Roger lights up the whole room with his charming persona and smile. I’m glad to see him have a chance to be ‘happy’ for a change (even if it’s only for a little while). Bringing Angelique back as Cassandra is a stroke of genius. Since returning from 1795 we’ve had three doppelgangers pop up – Jeff, Stokes and Harry – and now a fourth. With the portrait’s effect on Roger, there’s an expectation that Angelique will also make an appearance, but that she shows up with another name and different look is a genuine and very effective surprise. For a split second the audience does wonder whether it really is Angelique but that’s pretty much over as soon as she starts laughing at the end. While they may have been able to play out the mystery of her identity a bit longer, that isn’t really the emphasis of her story (and hey, if that’s what you’re looking for, there’s always Jeff/Peter). It reminds me of Hitchcock’s decision in Vertigo to reveal the twist to the audience before the main character. It takes the story in a different route and he wanted the viewers to focus on that rather than waste time wondering about the character’s identity. I think that’s similar to what’s happening here on Dark Shadows. Great point about Hitchcock and VERTIGO. Aside from the dramatic irony created (as the audience knows something the protagonist does not), the decision allows the audience to maintain empathy for Scottie, whose obsessive recreation of Judy is horribly abusive but we know that Judy is not innocent and is essentially “suffering” for her sins. Letting us know that Cassandra is Angelique serves a similar purpose. We don’t waste time feeling sorry for her and how the family — especially Barnabas and Vicki — treats her. This sometimes feels like a “lost” art. Too many series go for the “shock” twist reveal when the otherwise close friend turns out to be evil. That might be effective for about eight seconds but it comes at the loss of potentially months of the audience being “in” on a secret. Agree. And it could potentially stall other storylines. For example, if they had decided to delay the revelation that Cassandra is in fact Angelique, we would have to wait for her to start wreaking havoc on Barnabas and the family (and really, THAT’S what she’s there to do). I find it interesting that that’s exactly what happens with Jeff/Peter. Literally months spent wondering if they are in fact the same person and the story doesn’t progress at all. So this isn’t Cousin Serena at all? “…the freak from Martinique.” And that crazyface screencap! You did it again, Danny! Laughed so hard I almost lost bladder control. You may have to put a disclaimer on your blog about the health and safety risks involved. I agree completely! Additionally, “Look what the cat drags in”. Roger = Joshua = cat! Very nice. I read this in the Quiet Car on Metro North (NYC commute). I have had to laugh into my shirt sleeve many a morning or evening to not get booted right out of here (Quiet Car denizens will surround a noise maker like Lord of the Flies). It’s taking my life in my hands sometimes. John, I almost fell out my chair at work laughing at this episode. Danny you are a fool! “freak from martinque.” too funny! This is a purely personal anecdote but as I was watching the 1795 storyline, I despised Angelique because she reminded me of a horrible former girlfriend of mine who used emotional manipulation, attacks against my character and all sorts of dirty tricks to get her way. Now she has come back as Cassandra which ironically, is the name of my insane former girlfriend. “And that’s all I want to say,” says Barnabas… before immediately saying some other things. Not only do they dispense with a long, pointless ‘is she or isn’t she’ storyline, but Angelique’s surprise return isn’t even a Friday cliffhanger – it’s the first act break on a Wednesday. This really isn’t the same show that took 100 episodes to say out loud that Roger committed the crime Burke was imprisoned for. In the same vein, we get an argument between Liz and Roger that goes precisely nowhere – but unlike the old days, it’s good; witty and fast and well-characterised, with both Bennett and Edmonds on fine crackling form. Ooh, and I think I found a blooper! During the credits you can hear voices, just about – filtered and crackling. Can noise, probably. Unless it’s just me…? These are things I could look up. And I’m the only one bothered by them. The first isn’t so much a bother as a recent memory thing. Which recent episode was it in which Barnabas said something about something being so incredible that he wasn’t sure it was believable? Not today? What a strange line. Now I would have to go back further to check this, but the Collins family in the 18th century had a shipyard where they built ships. Supposedly they don’t anymore in 1968. They have a fishing fleet and a cannery. I don’t think they used to call the place where the fishing boats were a yard. Don’t recall what they did call it, but it is jarring to hear Liz and Roger talking about “the yard” as if by taking us back to 1795, both characters and actors are now importing the situation from back then into the present. Maybe Vicki came back to an alternate 1968 where the family is still in the shipbuilding business. More likely, the writers are confused and, hence, so is everyone else. “One mistake can multiply into a thousand,” I thought this was fraught with meaning, considering that first fateful steamy encounter with Angelique in Martinique, and the chain of events that followed.